Once Contacts / Students have opted to receive text messages from you, there are 4 ways for them to opt-out. Contacts and students can opt-out of receiving texts by toggling the Allow text messaging? to the left (this clears the blue highlight). 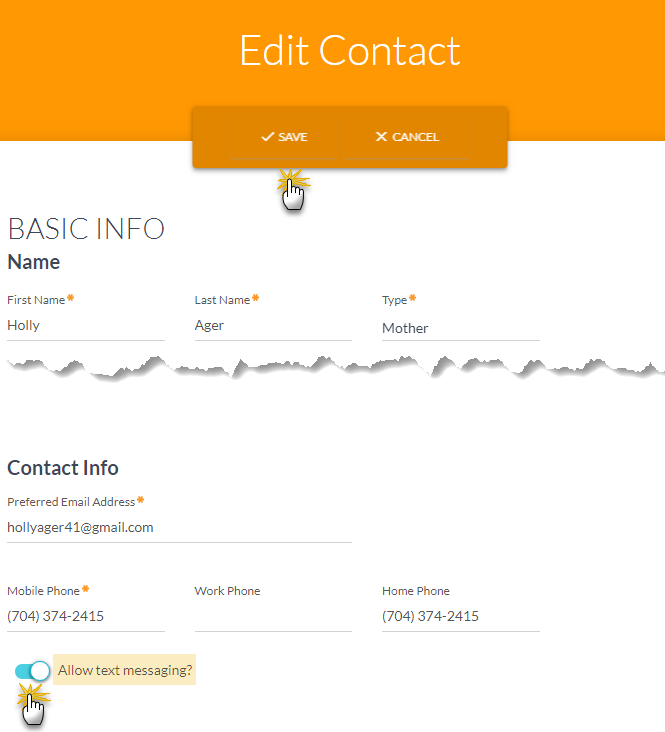 This setting is located on both the Contact and the Student profiles. The contact currently logged into the Portal will go to Account > Settings and use the pencil icon. 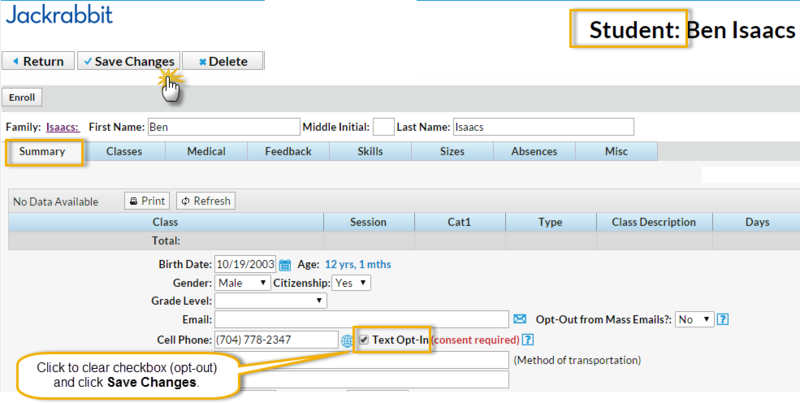 If the parent would like to opt-out another contact in the family they will go to Account > Contacts and use the Edit link. To opt-out a student in the family the parent will go to Account > Students. Click View (student name) and then use the pencil icon. You will receive an email (to the email address you've entered in Tools > Edit Settings > Organization Defaults > Organization Email) notifying you that the customer has opted out of receiving text messages. A Jackrabbit user with texting permissions can uncheck the Text Opt-In checkbox for a Contact or Student. This checkbox is located next to the Cell Phone field on a Contact's page and next to the Cell Phone field on a Student's Summary tab. After unchecking the checkbox, be sure to Save Changes. When the Contact / Student has received the email and clicks on CLICK HERE, they'll be directed to a web browser page with the option to opt-in with Yes, Send Me Text Messages or to opt-out with No, Do Not Send Me Text Messages. 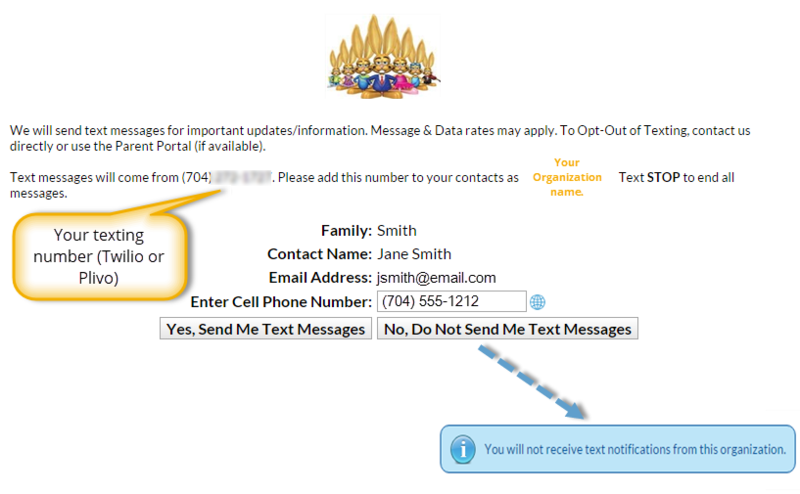 If they had been opted-in previously clicking No, Do Not Send Me Text Messages will update their record in your database to show that they have now opted-out of receiving text messages from you. Confirmation of this is sent to their email address as well as to your Organization Email. At any time after opting-in to receiving text messages a Contact / Student can reply 'STOP' to any received text message to opt-out from future text messages. The Contact / Student record will be updated in your database and they will receive a notification text in response. You will receive a text messaging opt out notification.